Last night I popped up a formula for calculating the stitches on a particular row in the cap of a set-in sleeve. And I kind of just left it there, with no explanation. My excuse is my eyelids were sticking to my eyeballs from lack of sleep. So, now let’s not talk about knitting or maths at all and go on to glass production. In 1953, the Pilkington brothers developed the float-glass method for making flat glass. In between, if you wanted flat glass without a pontil mark, your blower would blow up a cylinder, knock off the ends and cut the still malleable glass up one of the sides. 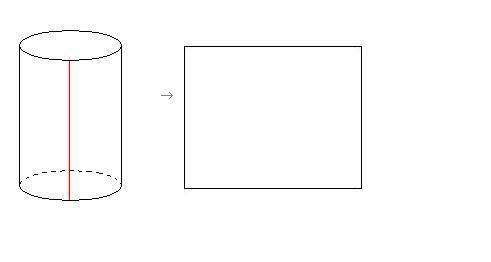 He then opened and flattened the cylinder into a rectangle. It never went completely flat, which is why some old glass looks “wavy”. Sleeves at their most basic are cylinders. If you knit one flat, you make a rectangle just like the glass cylinders above. Now, scale it up just a teensy bit, and a sleeve can probably be better approximated by a truncated cone intersecting a plane. 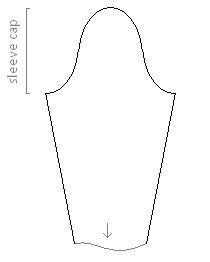 Unless you’re making a cap sleeve, the armhole is also a closed curve. Hence, it’s an ellipse. Just needs a bit of chopping up to get it flat. A set-in sleeve on a pattern schematic looks like the below. (Actually, usually they’re a bit wider, proportionally speaking). a is half the width of the ellipse and b is half the height. This will give you the stitches for a quarter of the ellipse (i.e. the curve in the positive x & y quadrant on the cartesian plane), you need to double it to get the stitch count for an entire row and mirror it to get the corresponding bottom half of the ellipse (where y<0). We want to do set-in sleeves. We’re not actually knitting an ellipse, we’re knitting the cylinder from which an ellipse has been cut, i.e. the negative space of the ellipse. So the sleeve circumference at its widest point (usually, unless you’re doing a bishop or bell, more on that to come!!!) is usually at the bicep (check out this knitty winter ’04 feature). Call this circumference c Assuming a sleeve which is the same width as the armhole at the intersection (i.e. straight, not a puffy sleeve with extra material), then a is c/4. b is half the depth of the armhole. Very important note: these are the measurements of the fabric, not the model. So that’s my convoluted THEORY. Need to knit it up and see if it works! I’ll update again when I do.